Cupping is an intimate act. Sniffing, slurping, then spitting one’s coffee in a room full of strangers is an easy way to look crazy, unless one is standing at the tasting table at Belleville Brûlerie. Then it is not only acceptable, but encouraged as part of the cupping process. The table plays a key role. Cupping, the process coffee professionals use to evaluate the quality of coffee beans and analyze flavors and aromas, requires a lot of glasses and therefore, a lot of space. The slim mustachioed men behind Belleville Brûlerie, David Flynn (formerly co-owner of Télescope), Thomas Lehoux (Ten Belles) and Anselme Blayney (Ten Belles and Le Bal Café), commissioned their handmade table in Serbia specifically for this purpose. Twice a week, on Tuesdays and Fridays, they open up their bare bones production space for cupping sessions with baristas from the various cafés they supply, including (but not limited to) Kooka Boora Café, Holybelly, Le Bal Café, Ten Belles, Fragments, and Fondation Café. Starting November 16th, on Saturdays, they’re cupping with the public, too. More than anything, cupping is for the roaster. Tasting and evaluating each week’s freshly roasted beans is a method of quality control. 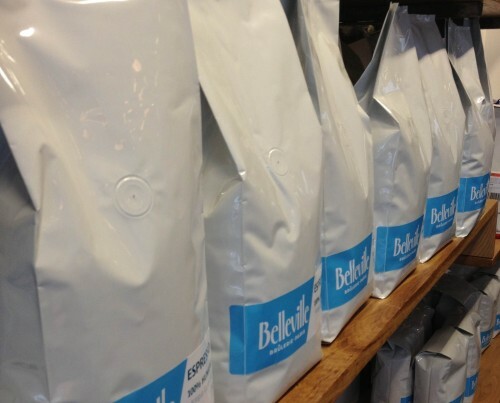 “If I’m not cupping on a frequent basis like this, then if a café calls me up and says they have a problem with something, I don’t have anything to fall back on,” says David Flynn of the Belleville Brûlerie. Frequent cuppings allows the brûlerie a constant stream of feedback from the baristas with whom they work. Tom Clarke, owner of Coutume, a roaster and restaurant in the 7th arrondissement, agrees. “They see how much work goes into it from the outside and then we get to tell them about how much work has gone into it from the plantation and harvest, the sorting, the processing and all that.” For him, the education of baristas and shops is key so that they can correctly prepare Coutume‘s product and communicate with their own customers. “The restaurateurs and café owners are really starting to care about it,” he says. For the baristas, the reasons to cup are multiple. They learn to recognize the flavors & aromas, challenge their senses, and improve their ability to communicate about the product with clients, thereby justifying the extra time and expense involved in producing a quality cup. It’s also possible for amateur coffee enthusiasts to get in on this cupping action. Just like with wine or cheese tasting, the chance to sample products side by side and become attuned to flavor nuances is a matter of exposure and practice. Those who want to develop their coffee palate can now participate in cuppings every Saturday at the Belleville Brûlerie and occasionally at L’Arbre à Café, Coutume and Café Lomi. The week’s beans are sorted into six groups and labeled with serial numbers for a blind tasting. 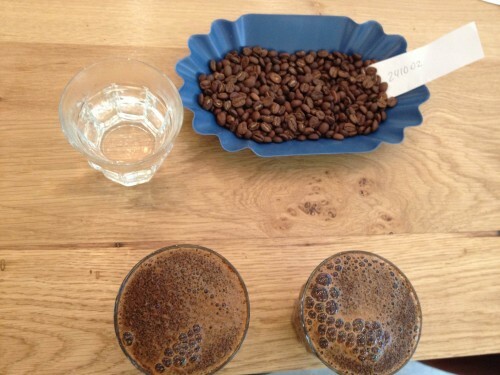 When cupping, you set out multiple cups from each batch to ensure accurate samples. In our case, that means two cups for each blind sample, which are each precisely weighed to ensure the appropriate grounds:water ratio. The beans are then freshly pulverized and poured back into the glasses. We are directed to go from cup to cup, swirling the powder in the glass like wine, then inhaling and silently noting the aromas of the fragrant fresh grounds. Hot water is next poured into each of the cups and allowed to settle. The goal, at this juncture, is to allow the grounds and water to mix and then form a crust at the top of the glass. A timer is brought out, and 4 minutes added to the clock. You’re not allowed to touch it, but you do want to sniff the crust at this point. Try not to be disgusted at the phrase “sniff the crust.” Note the aromas. They will change. Once four minutes are up, the real action begins. Taking a spoon in hand, bend over the glass, break the crust of grounds that has formed at the top by shallowly pushing the spoon away from you while simultaneously inhaling. In a very serious tasting, all the crusts are broken by the same person for each cup to ensure continuity/accuracy. Once you’ve got that step under your belt, skim the grounds off the top. This is where the tasting (finally) begins. Grab an empty coffee cup, dip your spoon into the first sample, place it in your mouth and… aspirate it. You read that correctly. Aspirate it. The audial effect should be similar to a donkey wheezing. The louder the slurp, the better. The ensuing spray of coffee up your throat and into the back of your nasal passages will actually allow you to smell more aromas. Just don’t choke. Take note of the flavors you’re getting on your tongue (and in the back of your nose) then spit the coffee into the empty cup in your hand. Rinse your spoon and move on to the next sample. Keep rotating around, sampling, slurping, and spitting until you burn out your tastebuds. It’s important to keep circling round the samples while they cool, as the flavors will transform in the coffee as the temperature drops. Now’s your chance to compare tasting notes with your fellow coffee geeks. What are the flavors – chocolatey? earthy? red fruits? What about acidity and mouthfeel? Which ones were pleasing to you? Are there faults in the coffee (i.e. over-roasted, not fresh enough, too flat)?